IN COLD BLOOD remains one of the 100 greatest novels of the twentieth century, a study of crime and a polemic against capital punishment that is without peer. Truman Capote purportedly considered it the “first nonfiction novel,” ushering in the era of New Journalism, as defined by Tom Wolfe. It also was the catalyst for a century of crime reporting in America, and crime coverage is by definition popular, involving heightened dramatic conflict, human interest, and questions of morality. 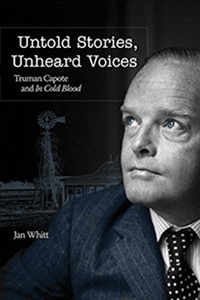 The study focuses upon the voices left out of IN COLD BLOOD, which Capote wrote during his whirlwind race to an imaginary finish line. In addition to his lifelong quest to believe in himself and to be the center of every party, Capote was determined to compete with his friend Nelle Harper Lee and her unprecedented success after the publication of TO KILL A MOCKINGBIRD (1960) and the release of the film by the same name (1962). The films CAPOTE (2005) and INFAMOUS (2006), drawn from two biographies about Capote, testify to his unrelenting desire to make IN COLD BLOOD his magnum opus. Until his death in 1984, he never wrote another book.